Graphic design tips and tricks with guest bloggers from the industry covering graphic trends, software and graphic resources. 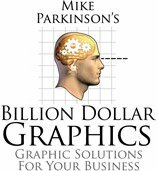 The Billion Dollar Graphics blogs promotes the importance of good visual communication. Visit Billion Dollar Graphics's profile on Pinterest. Download editable PowerPoint graphics. Free samples.